is HERE! Not only does this 4 page pdf feature our class schedule and and a handy plan-ahead guide, it also contains the CORRECT CLASS SCHEDULE! The schedule that was posted to Passport this week has a couple of errors, which soon shall be fixed. Please note that some class registration codes may change once Passport is updated. All changes will be posted here. Remember that everything is subject to change. Kay Wolff’s LH834 Creative Celebrations class is under way, and with a very full class. Fall classes, and possibly a summer class, will be scheduled and announced here soon. See below: FEE-BASED, or fee class page for more information on the Floral Design program. are designed to prepare students for work in all horticultural fields: Arboriculture; Landscape Design & Construction; Landscape Architecture; Parks & Maintenance; Nursery & Greenhouse Management; Floral Design; Aesthetic Pruning; Permaculture. FEE-BASED NON-CREDIT CLASSES = No homework NO grades. No semester-long commitment. No lengthy online application. Open to all, these non-credit, pay-as-you-go classes are fun and enriching regardless of experience or knowledge level. 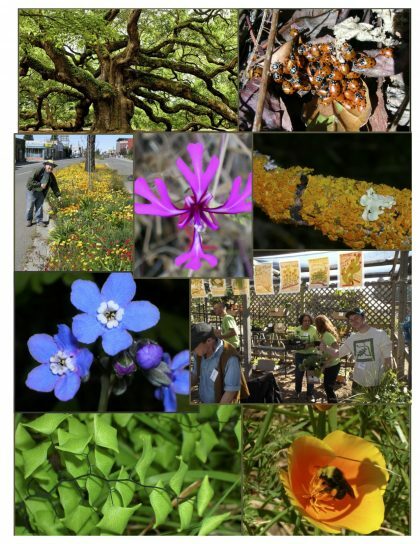 This spring’s classes include Intro to Floral Design, Pruning Deciduous Fruit Trees, Intro to Aesthetic Pruning, Bonsai, Pruning CA Natives, Art of the Laceleaf Maple, and many more.
! Interested in hemp growing? We’ll likely be offering the first of these new classes this semester, so watch this space for news! Merritt’s fee-based classes are not listed in the online Passport schedule, they are available through the department only. * You cannot enroll in fee-based courses through Passport. For more enrollment and fee-based info, see our fee-based page, or the below class registration form. 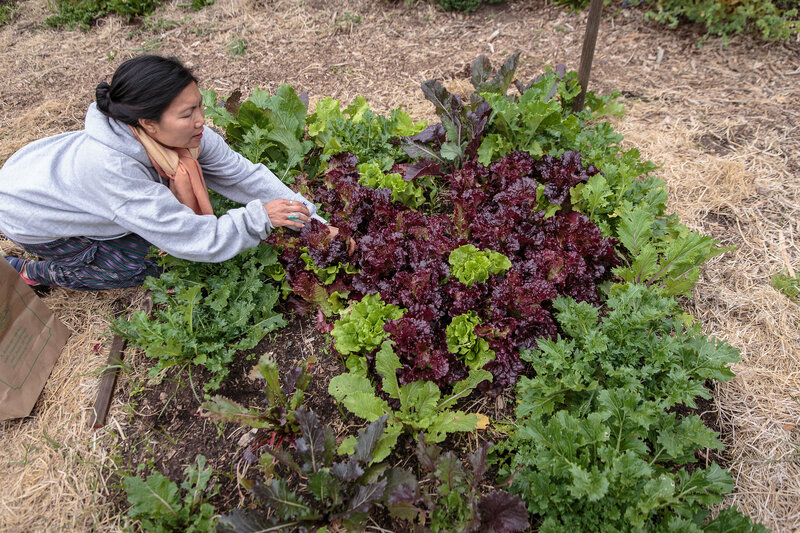 Saturday Fee-based pruning class enrollment:: enroll in advance or day-of. Day-of registration: Please arrive at least 15 minutes early, enrollment form and check in hand. It is helpful for us to anticipate the number of students, so let us know you’re coming via an email to mbull@peralta.edu (didn’t get to that email? Come anyway). More info/instructions on the FEE-BASED ENROLLMENT FORM. Class times and costs may be found on the above Pruning class schedule. 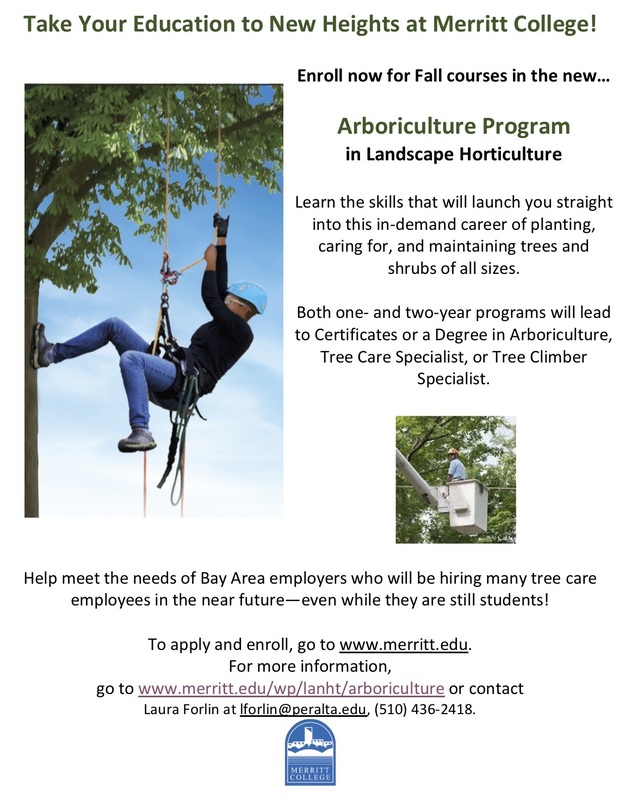 Our new URBAN ARBORICULTURE program kicked off in Fall 2018, and the students will tell you it’s a great place to learn all there is to know about urban forestry. 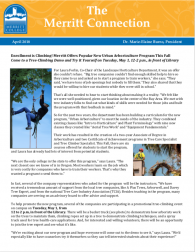 We offer two certificate levels: Tree Care Specialist (21 units) and Tree Climber Specialist (41 units), and an Arboriculture Associate of Science degree (41 major units + general education requirements). Driving: From the Warren Freeway, HWY 13 South, left off of Redwood Road exit; from HWY 13 North, exit Carson Street, forward to top of hill, right on Redwood Rd. 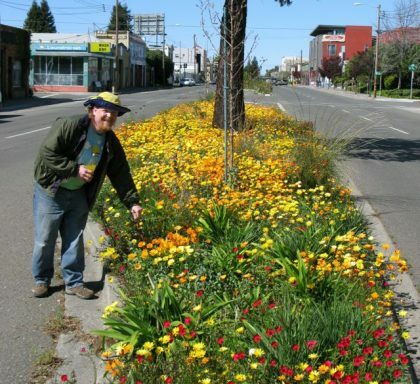 ; from MacArthur Freeway, 580 East, exit and turn left onto 35th Avenue, in 1.7 miles, 35th Ave. becomes Redwood Road. 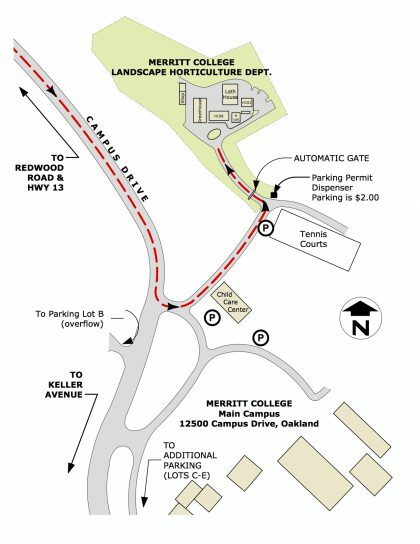 Drive.06 miles up the hill from the Redwood Shopping Center (near Hwy 13 exits/where 35th becomes Redwood), and turn right on Campus Drive. Drive .07 mi., the campus will be on left. Left turn into the first of the two loop road entrances, then take immediate left onto road before childcare center. Drive .1 mi. ; you’ll see tennis courts on your right. Turn left to Horticulture dept. auto gate, which opens automatically when we’re open. If it does not open during scheduled class time, please notify us immediately at (510) 436-2418 (main office) or 436-2491 (field office). Hours: We are usually open by 8:30am and close when classes end for day – consult the current class schedules for current details. In fall and spring, classes end at approximately these times: Monday- Thursday: 9:00 or 10pm; Fridays: as early as 4, as late as 5:30pm; Saturday academic classes may be on field trips, however, check our Aesthetic Pruning class schedule, as well as our current academic class schedule for Saturdays that we’ll be open (most pruning classes end by 1pm). Summers: Classes are only offered Monday- Thursday, but open hours may include Fridays. Please check this page later, as summer open/staff availability hours will be posted (+ check schedule). *You can rely on our self-published Hort Dept. schedule, and you can always find that, important advisories, and news of updates posted to these pages, however, the Merritt/Peralta-wide printed class schedules are printed months in advance, and will not show classes that have been added or day, time, instructor, etc. changes, and may show classes that have since been canceled. All programs, across all four colleges, have class schedules that are subject to change, so always check the continuously updated Passport online class search, and if you have already enrolled in classes, it is wise to periodically log in to your Passport Student Center to check for advisories and updates to your personal class schedule. For detailed curriculum information, visit our COURSES and Degrees and Certificates pages. Download a pdf file of our program offerings HERE. Plan ahead- THIS pdf shows projected class scheduling (day/evening fall/spring) through 2020 (everything being subject to change). For up-to-date course descriptions and degree/certificate info, see below links. Floral Design and Aesthetic Pruning Class information and schedule archives may be found on the fee-based class page.